Writer Nicelle Davis: I thought that the color red would jump out from between the lines, and to my great joy red came when I called it. 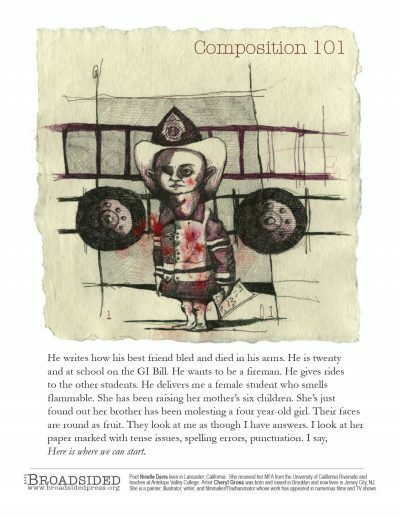 Artist Cheryl Gross: I found the poem to be deliciously disturbing. I was able to pull out the creepiness and make subdue it. This to me is how the ugliness in life operates, on a more restrained level. That is what I am trying to convey in the illustration. It’s a combination of innocence, control, guilt, and fright. It captures that moment in time we can all relate to, and be discusted by at the same time. Writer Nicelle Davis: To my amazement the visual artist did not stray far from my own visual dreamscape. Cheryl Gross’s illustration validates the experience of the poem completely. I love the child’s head attached to the manly Adam’s apple; he is such a lovable haunt. Artist Cheryl Gross: Right from the beginning it was a perfect fit. I had no doubt that the design and piece would go together. Writer Nicelle Davis: Anytime I write I am terrified of coming off as contrived or insincere. I write about what I know; every poem is an interpretation of someone I love. I often feel like my poems are a message in a bottle. Like any message tossed off the coast of a deserted island, the poems are meant to call for help, are meant to exclaim, There are real people in here who need your attention. I mean for the poems to scream, not whine, for a necessary kindness. The students in this poem are strong in ways that are uniquely human; with blood on their hands they are the truest image of purity that I know. I am very grateful (indebted really) to Cheryl Gross; her illustration appears as an act of listening. She hears me and believes me. I didn’t expect this. Her drawing seems to be a responds to my call. This is the greatest gift a poet could ever receive. Artist Cheryl Gross: I have been developing a fairly new style using line, tonal values, and negative space. This lends itself to the creepiness of the poem. To add to the unsettling nature of the piece, I added a few more blood stains using Photoshop which were not in the original illustration. Writer Nicelle Davis: My father is a visual artiest. He fed me crayons and I think it was expected that I would grow up to be a painter. When I started bringing poems home it was somewhat shocking for my parents—it was as if I were bringing home puppies from Mars. The puppy part of poetry was expected, but the green fur and third eye was a little off putting. I find that there is a lot of overlap in the arts; all mediums are inspirable. I couldn’t write without having a visual of what I’m describing first. I wouldn’t understand the music of words without the Ramones. I find poems to be inherently theatrical. I love the arts for never forcing an artist to choose. It’s a free for all. Free being the key word. If you had to represent the Broadsided of “Composition 101” with one word, what would it be? Writer Nicelle Davis: Oh man, yes. I’ve been on a French kick lately. My goal for this week is to read The Random House Book of Twentieth Century French Poetry and Maldoror by Comte de Lautreamont. Artist Cheryl Gross: Just Kids, by Patty Smith. Artist Cheryl Gross: Went to the Whitney Biennial. The work by Aurel Schmit was great. All the rest was forgettable. Writer Nicelle Davis: Oh yes, oh yes. Colette Calascione’s work is incredible (www.calascione.com). From my hometown of SLC there is Tim Willson (www.glassoctopus.blogspot.com) Grant Fuhst (online gallery) and Dennis Mecham (www.dennismecham.com). From my days as a glass artist in Eagle Rock, California I know of the amazing talents of Esther Rovin (see her glass work here) (see her firehoop here) I think Johnny Hughes does beautiful work (view video). I also have discovered many fine artists on the site Escape into Life. Writer Nicelle Davis: This has been the most incredible journey. Thank you Broadsided! Artist Cheryl Gross: When I first read “Composition 101,” I knew it wasn’t for everybody. It is the type of writing that appeals to a select audience. This to me is very important because it evokes an uncomfortable feeling we all experience from time to time, especially when we address our “demons” (for lack of a better word.) I found it honest, provoking, and nightmarish. It deals with these feelings in a calm yet sober way most people would rather not engage in. This is what Broadsided is all about. It embraces all aspects of life no matter how uncomfortable it may or may not be. It’s multi-level, and that is a very healthy way to experience life. Writer Nicelle Davis lives in Southern California with her husband James and their son J.J. Her poems are forthcoming in Caesura, FuseLit, Illya’s Honey, Moulin, The New York Quarterly, Redcations, and Transcurrent. She runs a free online poetry workshop at http://nicelledavis.wordpress.com/. She’d like to acknowledge her poetry family at the University of California, Riverside and Antelope Valley Community College. Image: 12″x 12″, handmade paper from India, archival ballpoint and graphite. Scanned it into Photoshop and modified.